I’m not sure when I started to fall in love with Patchwork Snowmen, but it looks like every year I need to make one more! This year I could not miss it, this year this new snowman is small and of course the pattern is for Paper piecing!. 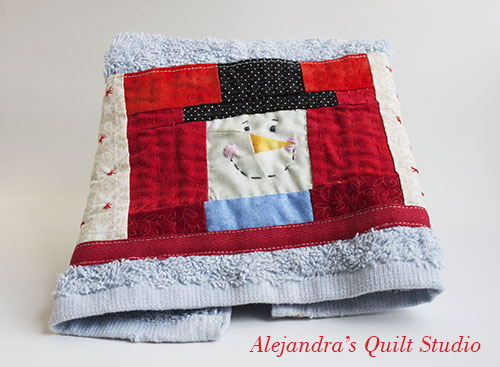 This Snowman Patchwork Hand Towel is easy to make, it won’t take you long to finish it. 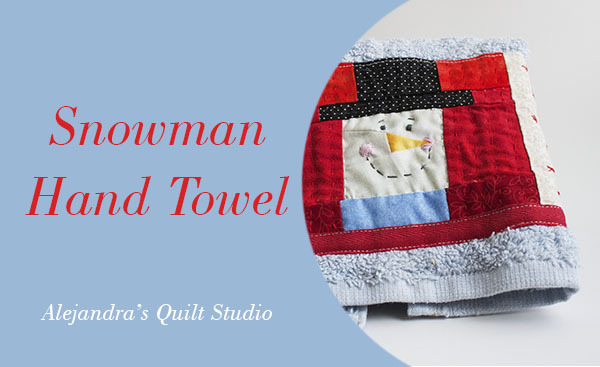 All you need to do is to buy a hand towel, make the snowman and do a little of hand quilting and if you prefer to make it by machine, it will look great too! You will need to make it just a few little pieces of fabric, you might have them all on the basket where you keep all those little pieces you don’t want to put away! Quilters can’t do that, we just need to use every little piece!. Just follow the paper piecing pattern according to the numbers and color to make the snowman, then add the two pieces of white fabric on each side and applique it to the towel. I don’t use any batting fabric, the towel texture is perfect to work like batting when you do the quilting, and it’s soft and easy to work on. This time I also made a short video to share with you some of the stitches I made for the hand quilting. Have some fun while you do the quilting, you can do it the way I did it, or you can come up with your own design for the quilting. I thank you for making the time to stop and read my blog! Pattern will be here tonight!.